Computer artwork of a brain. 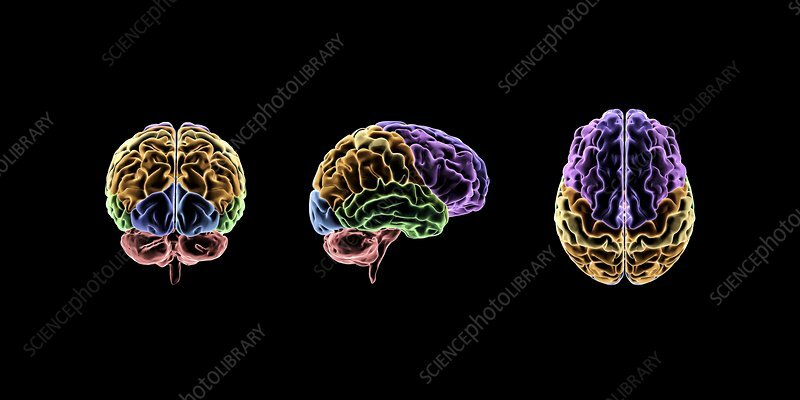 The brain is divided into several lobes according to their function. The frontal lobe (purple) is thought to be responsible for cognition and conscious thought. The parietal lobe (yellow) is thought to control most sensory information from the outside world. The temporal lobe (green) is where the senses of smell and sound are processed along with complex stimuli like faces and scenes. The occipital lobe (blue) is responsible for visual processing. The cerebellum (red) controls motor coordination and balance.